Aileen: Welcome, to the A&P Professor. A few minutes to focus on teaching human anatomy and physiology with host Kevin Patton. Kevin Patton: In this episode I introduce the new Android app for this podcast, and I interview my good friend Paul Krieger about his use of art in teaching anatomy and physiology. Kevin Patton: In previous episodes of this podcast I’ve mentioned that an easy way to keep up with all the new episodes as they come out. Maybe go back and review, search through and review older episodes is to do so on an app. Either a podcast app or a radio app. Many of you are comfortable don’t and have found that, that is an easy way to stay up to date with this podcast. But there are many people who find it much easier to just use a dedicated app and I know have one of those for you. Now, this one only works with Android devices. So if you or someone you know uses an Android device and would like to keep up with the A&P Professor they can go to the Google Play store and just search for the A&P Professor. You’ll find the app, it’s a free download. Download it to your device and then it’ll always be there. A little reminder will pop up when a new episode is available. You can search through a previous episode for a particular topic and so on. There are also additional files and things like that that will be added as we progress through more episodes of this podcast. So, you actually get bonus material by using that app. Kevin Patton: There will be an app for Amazon Kindle devices, and an app for Apple iOS devices. Those are being worked on right now. They will be available soon. But right now you can go into the Google Play store and get that Android app. If you do give me some feedback and let me know how you’re liking it. Kevin Patton: Well, this is a big experiment for me. This is the very first episode where I’m doing an interview. So, welcome to the first interview episode of the A&P Professor podcast. The whole process of doing a podcast has been a real learning curve for me. I’ve heard from other podcasters that one of the hardest things to get right, especially when you’re starting out, is doing a remote interview. That’s especially true for those of us that don’t have a very deep background in audio engineering. So, I’ll let you be the judge and see whether we pulled it off or not. Kevin Patton: One great thing about doing this experiment is I get to do it with my good friend Paul Krieger who is a professor of biology up at Grand Rapids Community College. I’ve known Paul for over 15 years. I first met him at the Human Anatomy and Physiology Society where we have a lot in common both being A&P teachers and having taught other courses such as general bio and chemistry. But he’s also a member of the Textbook and Academic Authors Association, which I’m also a member. So, I’ve interacted with him in that context as well. Kevin Patton: Paul, by the way, helped me in my textbook develop that transparency overlay system called “The Clear View of the Human Body.” But he’s much more well known for his series of books with Morton Publishing which are called “The Visual Analogy Guides.” They cover fields like anatomy, physiology, and chemistry, and general biology and those are sold at college bookstores all over the United States and Canada. I’ve used one of them myself in one of my courses and the students absolutely love it. So, there is a link in the show notes, in the episode page, so you might want to check those out. Kevin Patton: Paul is a great teacher. I’ve actually sat in on a course that he taught for HAPS Institute, which is a continuing education program for A&P teachers. He has won several teaching awards and things like that. So, without further ado lets go ahead and get Paul on the line and we’ll go from there. Kevin Patton: Hi Paul. Thanks for joining us for my very first interview, remote interview on my podcast. We’re going to both make this an experiment and see how it goes. Of course, all the listeners are in on that experiment as well. I understand that you’re talking to us from your home office, is that right? Paul Krieger: Yes, I am. I have a home office in my basement and that’s where I’m working right now. Kevin Patton: Okay. I guess that’s where all those great visual analogy guides that you work on, they’re mostly created right where you’re at right now. Paul Krieger: Right. Exactly. I do a lot of my authoring work at home in my home office and I also do a lot of things in illustrations. So a lot of that work takes place here. Kevin Patton: Okay. Cool. Well, lets get right to it. Speaking of illustration, you and I were communicating in anticipation of meeting up with each other at the HAPS conference, you mentioned that you’re starting to do this thing with your students called contour line drawing. Not being an art guy myself, I kind of have a rough idea of what that might be. But, what does that mean exactly, contour line drawing? What does that have to do with A&P? Paul Krieger: Good question. So, contour line drawing is really an artistic technique so it really is an art terminology. What it really means is to draw the outline. So contour line is really referring to drawing the outline of some structure. For anatomy we all know that understanding structures is really essential for knowing key information. So, this refers to getting the students to actually do the drawing themselves. Paul Krieger: So, like in an art class where everyone might be drawing a still life of the same thing, the students are all working on drawing the same image. That’s kind of what we’re doing here is we’re trying to get the students, like students in an art class, to draw the outlines of key organs such as maybe a lung, or a larynx, or a microscopic structure such as a villas. By doing something like that it really helps them to really focus on shapes, and relationships, and things like that. So that’s what contour line drawing really refers to. So the students are actually doing the drawing themselves. Kevin Patton: Okay. That sounds cool. So, you describe this as sort of like in an art class where they’re doing a still life. So, do you have … I can imagine in an art class there would be an apple an an orange or whatever sitting on a table and everybody’s gathered around and drawing that. Do you have some kind of model or organ there? Or how do you get the students drawing? Paul Krieger: Okay. So, to give you an example, one of the first times I tried this recently, and I’m still at the experimental stages of using this myself, is that I tried it for a respiratory anatomy lab. So the way that it worked was I kind of thought about how I was going to do it. One possibility is I could have went right to the marker board and had the students all have a blank sheet of paper in front of them and I could of went to the marker board and kind of drawn the outline of the key structure. Such as the lung, and had them copy me as I’m doing that. That’s one option. Paul Krieger: But what I did, was instead was a variation on that. I actually … I did the drawing in a PowerPoint where it was I was showing line by line how to draw the shapes of key things. So, I just kind of did it step by step. So I created the drawing in a PowerPoint. So, first time I start with a left lung, then a right lung. Work my way through key structures for respiratory anatomy. So I had a PowerPoint, if you can imagine, imagine you’re a student in the lab. You’re looking at the screen and I’m walking around the room controlling the PowerPoint slide remotely. So I’m using the remote control to go through and the students are seeing the image on the screen while they’re drawing it out. I had them divide their sheet of paper into quadrants and they could do key slides step by step. Paul Krieger: So, that’s kind of how the process went if you can visualize that happening in the lab. Kevin Patton: Yeah. Now, you said this is happening in the lab. So, this is an activity that you do in the lab part of your course? Paul Krieger: Yes. That’s how I experimented with it. Again, it’s just something new that I’ve been trying. It seemed to go quite well so I’m definitely going to do a little bit more of this. But, it could be easily adapted to a lecture format, or even an online class format. You could, if you did it in the PowerPoint way that I did you could do that in a lab setting. You could just as easily do it in a lecture setting. You could even have that … You could do, for example in the structure could maybe do a camtasia video, have a recording showing the process. If it was an online class a student could be doing the drawing on a blank sheet of paper at their home for an online class. Paul Krieger: So, I think it’s very easily adaptable to the lecture, the lab, or to an online class. It certainly wouldn’t have to be restricted to the lab. But the way that I did it was I really wanted them to focus on key structure before we went into our cadaver lab. We have a cadaver lab that has six cadavers. It has three plastinated specimens, whole body. Then it has three [less 00:11:23] specimens. In addition to that we also have an organ bank. So I can haul out a bin that has an actual lung in it and show the students a less specimen of a lung. Paul Krieger: So, by doing the drawing first it was kind of a nice preview to going into the cadaver lab. I thought that for the way that I was running the lab that worked out quite well. Kevin Patton: Yeah. It sounds like you really can adapt it to all kinds of learning situations, which is great. So, for our listeners pretty much anything they’re doing in their A&P class our there they can probably find a way to try using this technique with their students. Kevin Patton: But, one thing before we get much further that I want to kind of come back to is the art part of it. Kevin Patton: Art, making art has been something that’s been a little bit scary to me ever since third grade when my third grade teacher looked at the hamburger I had painted that I thought was beautiful and realistic and everything, and actually remembering back to what my hamburger looked like I think it was actually pretty good. But my third grade art teacher told me never, ever go into art you’re horrible at it. Paul Krieger: Oh, I’m sorry to hear you had that negative experience. Kevin Patton: Well, you know I think everybody’s got a story like that with something. But, I later went and did take some art classes. But I always shied away from the drawing part of it. Probably for that reason. But over time … When you teach anatomy you can’t hardly get away from drawing. So, I’ve had to do it on the marker board and when a student comes to my office and and I kind of draw, sketch something out for them. Whether it’s a simple diagram or it’s an actual organ or whatever. I’ve found that the more you do it, if you just jump in and do it it’s not so bad. Kevin Patton: So, for those anatomy and physiology instructors out there that maybe … This sounds to me like it’s very doable. You sent me the PowerPoint presentation for the lung and other respiratory parts. You sent that to me and I went through it and I thought, “Oh my gosh. I want to to this.” Because I don’t know if Paul’s description was very clear. But, he’ll make just one line along the side of the lung. Then the next step is another line somewhere else. Kevin Patton: So, at first I didn’t know what he was drawing until it started to take shape. I think if students learn that way rather than started with the idea like, “Oh my gosh. I have to draw this whole lung.” If they just really focus on that one line and then the next line. Kevin Patton: Then the next line. Kevin Patton: How do your students, how do they react? Do they feel … I mean, do you sense any apprehension, or uncertainness when you say, “Okay, we’re going to do drawing today”? Paul Krieger: Right. So, yeah. I was interested, I was keenly aware of what you mentioned. There’s always going to be some students who are art-phobic or who had a bad experience with art or who are very tensed up just about the idea of drawing. So I was keenly aware that not everyone was going to like this activity. But then it’s almost like anything that you choose. If you choose a writing activity in class there are students who love writing and hate writing. So, anytime you’re dealing with a large group of students you’re always going to have some student that like it, some students that don’t. Paul Krieger: So, I was interested in observing how they were going to receive this. What I noticed is that most of them liked it. So the majority of students liked the activity because I did explain to them the utility of it ahead of time. I said by doing your own drawing you’re focusing on key structures and the sizes of things and the shapes of things. You’re really, rather than just passively looking at it image you’re making it your own and you’re understanding it better. You’re also understanding key structures the way they really look better. So, after I showed them the utility of it they at least, even those who were reluctant to draw, gave it their best shot. Paul Krieger: One thing that I noticed, and this … Actually, may be a benefit of doing the PowerPoint, is I was standing at the back of the room and I was remotely controlling the PowerPoint. I noticed that they were very riveted on the screen. Their focus and their attention was very sharp. Much more so than passively looking at a generic PowerPoint presentation. 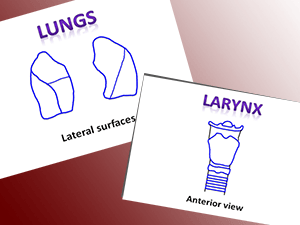 Because they were engaged in what was happening on the screen because they had to use their own hand eye coordination to replicate what was happening with that lung and the drawing of the lines to represent the fissures within each lung. The focus on really what was happening there and to translate it onto the page. Paul Krieger: So, there were a few of those but I’m happy to report that the vast majority of them I was looking at their final product as I’m walking around the room. Most of them did a very good job replicating the key shapes and structures. It was a useful study tool for them later. So, overall it went quite well. Kevin Patton: Well you said that it was a useful study tool for them later. What use do they make of this? I mean, I can see clearly that the process itself of making the drawing itself is a great learning moment, a great activity. If that were the end of it that would be wonderful. But it sounds like it’s not the end of it for at least some of your students. What do they do with it once they walk out? Paul Krieger: So, I should mention one other thing is that in addition to having them doing the drawing I also had them do labeling activities. So, I did this in a very intentional way to have them only do the drawing to start with. So, I’m having them do the drawing line by line, step by step and they’re doing all the key structures. Then they will complete it. Then when I got to the end of doing that drawing then I would point with a laser pointer on the screen and I would have them draw a label, like a leader line, from a structure then have them write the name of the structure in their own handwriting, which research says is always a better way to learn it. To write a structure out in your own handwriting. Just like making flash cards the old fashioned way, writing it out yourself. Paul Krieger: So, I had them all do that at the end so they could easily use that as a study’s tool when they walk out of class they could cover up the names of the structures and then quiz themselves on the structures. Just like you would do in an online assessment, or maybe in a workbook or some activity book. Very similar to that. So, that’s how they can use them outside of class. Kevin Patton: Okay. That sounds pretty cool. Have you ever had any of the students come back with additional drawings, or maybe additions to the drawings they made in class? I guess it’s still kind of early in your experiment. Paul Krieger: Yeah. It is too early for me to really have an assessment of that. I think later on if I do more of this in lecture in lab, probably what I’ll do is I might follow it up with an online survey such as Survey Monkey, something like that, where I can get some feedback from the students on it. It is kind of too early for me to say would that actually change students study habits to the point where they might do some of their own drawings outside of class. I think there’s certainly the potential for that. But, I haven’t collected any data regarding that at all. So that’s kind of yet to be seen. Kevin Patton: Well, it seems like as we were talking about a little bit earlier, it seems like there’s just all kinds of different things that a particular A&P teacher could do to adapt it to the way they’re already doing their course. Could include some of those post drawing activities and so on. Kevin Patton: It seems like the sky’s the limit with this thing. This is a great idea. I’m definitely going to be checking back in with you to see how it’s going in the long term. What other tweaks you’ve made to this process, what you’ve added, taken away and so on. If any of the listeners out there have any questions for Paul or any questions you want me to ask when I check back in with him later on just go to our episode page at theAPprofessor.org and contact us through the telephone line, or through the email address. Also at the episode page and in the show notes depending on what app you’re using to listen to this podcast I’ll have a link to an example PowerPoint file with some of the respiratory structures so you can really see exactly what Paul’s doing using that PowerPoint technique to get his students drawing. Kevin Patton: Paul, I sure do thank you for taking time out of your busy day to talk with us about this. I’m looking forward to seeing you at the HAPS conference coming up soon. Paul Krieger: Oh, it was my pleasure Kevin. No problem at all. I’m happy to do it. I’ll certainly be looking forward to seeing you at the conference as well. Kevin Patton: You may have noticed that I’ve been trying to get a new episode out every week. Now that we’re in the Summer part of the academic schedule I’m going to move to a goal of getting one out every two weeks. So, we’re moving from a roughly weekly schedule to a more or less bi-weekly schedule. So, if you’re looking for the new episode drop next week and get concerned about that, don’t worry everything’s okay that was planned. We’ll be doing a new episode approximately twice a month until we get back into the swing of things next Fall. Kevin Patton: Minor imperfections enhance the hand crafted uniqueness of this podcast.